If swimming in the Thames was dangerous, boating also posed real risks. In January 1885, two boats collided on the river at Putney. The five men in the smaller boat fell into the river; unfortunately one of them, an E Mackenzie, was unable to swim. The Rev Garnish was in the larger boat, but jumped into the water to rescue the drowing Mackenzie. Unfortunately, in his panic Mackenzie dragged his rescuer under the water and both were drowned. 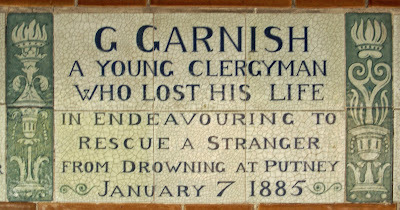 G GARNISH, A YOUNG CLERGYMAN WHO LOST HIS LIFE IN ENDEAVOURING TO RESCUE A STRANGER FROM DROWNING AT PUTNEY, JANUARY 7 1885. 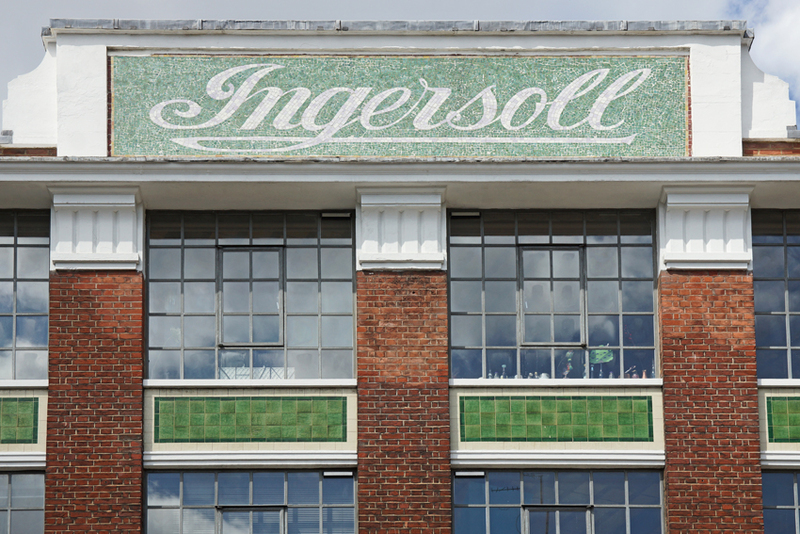 The name of Ingersoll stands out in fine mosaic on top of a building in St John Street. 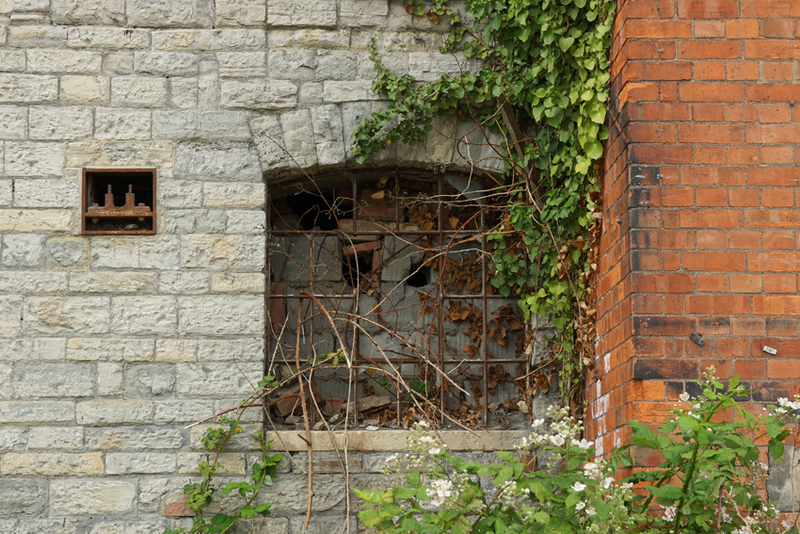 While the company has left, its former showroom and factory is a glorious reminder of the past. The building was designed by Stanley Waghorne in the 1930s, apparently as a speculative development, although Ingersoll soon put their mark on it. Having made their name in the United States with one-dollar pocket watches, the company was soon exporting large numbers to Simonds, a London department store. When Simonds closed, Ingersoll opened their own shop in London in 1904. (They priced the watches at the sterling equivalent to a dollar, five shillings: thus it was known as the Crown watch.) 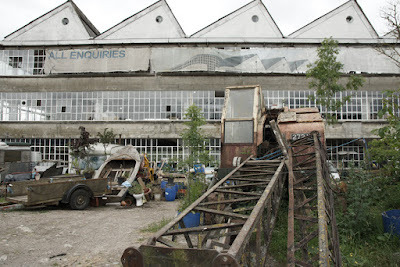 They were successful enough to start manufacturing too, and had their factory and showroom here until the Second World War, when they moved out of the city. 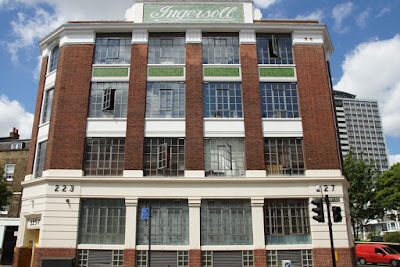 The building continued in industrial use until it was converted into flats in 1995; in the 1950s, it was the Vogue pattern factory. In mid-Victorian Britain, swimming became a popular leisure activity. Outdoor swimming pools began to appear, including the marvellous Thames Lido. However, with entry a shilling, the Lido was less appealing to many than the ponds, rivers and canals of London. 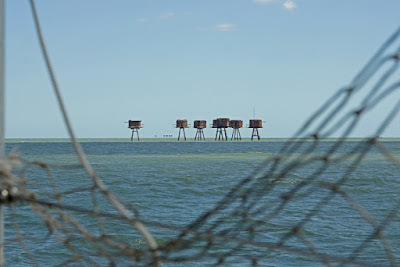 Unfortunately, swimming in open water poses greater dangers than bathing in a pool, and there is a generous scattering of drowning accidents on the Watts Memorial. 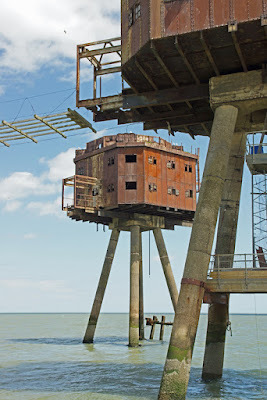 I've already considered the tragic stories of David Selves who died in the Thames like his brother before him; John Clinton, swept fatally under a pier; and Alexander Stuart Brown who caught pneumonia after rescuing someone drowning at sea. a very distressing fatality occurred at Kilburn, by which two little boys, brothers, lost their lives. Some excavations have recently been made in St Mary's-field in connection with building operations, and in one of the hollows thus formed a good-sized pool of water, several feet deep, had accumulated. The two boys - Frank Sisley, aged 11 years, and Harry Sisley, aged nine - sons of a cabdriver, living at 7, Linstead-street, Palmerston-road, were, it appears, returning home from school, when they placed a plank on the pool mentioned, and amused themselves as if in a boat. The raft capsized and the two boys were drowned. Having got on a raft, Frank Sisley, in attempting to reach something, fell into the water. His brother jumped in and tried to save him, but they both disappeared. 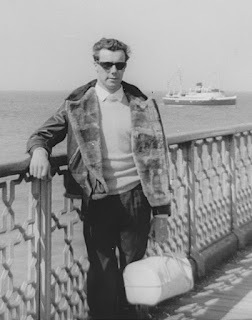 One of the other boys, named Pye, then entered the water with his clothes on, and succeeded in getting Harry to the bank. He was returning to rescue Frank, when Harry uttered an exclamation of distress, and either jumped or fell into the water again. His brother "cuddled" to him, and they went under the water together. Pye then raised an alarm, but when after some delay the bodies were recovered, all efforts to restore animation were fruitless. 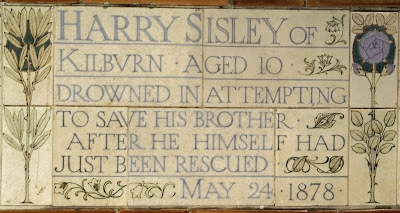 HARRY SISLEY OF KILBURN, AGED 10, DROWNED IN ATTEMPTING TO SAVE HIS BROTHER AFTER HE HIMSELF HAD JUST BEEN RESCUED, MAY 24 1878. 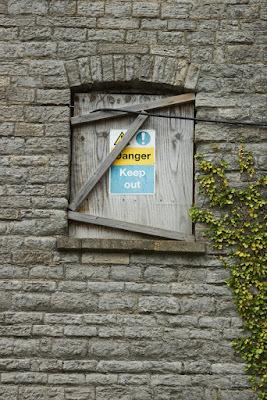 Until recently, Glastonbury was a centre of sheepskin goods manufacture. 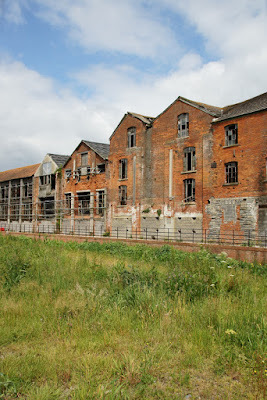 On Beckery Island at the edge of town stood the factories of two companies, Morlands and Baily's. 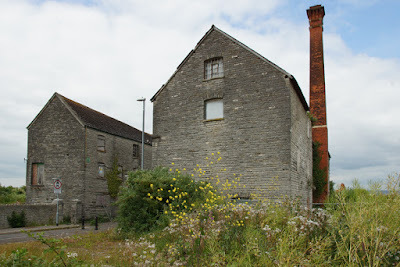 Morlands made sheepskin goods in the small town of Glastonbury from 1870, when John Morland was attracted to the tannery by the purity of its water. He remained chairman of the company until he died, aged 96, in 1934. By then, a Bauhaus-inspired modernist factory was being added to the original Victorian brick buildings. 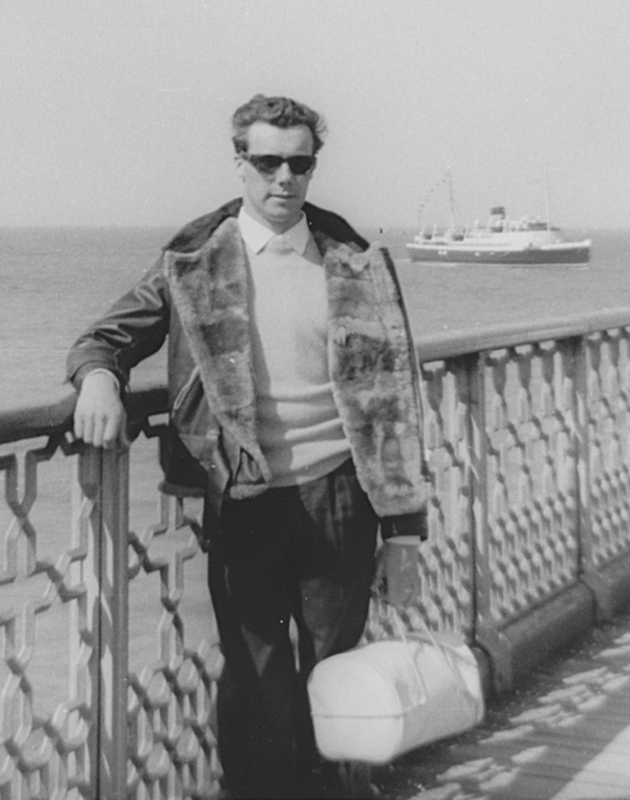 Early motorists and Battle of Britain pilots were grateful for the warmth Morlands' clothing provided; in the 1960s, sheepskin was fashionable and hundreds of people worked at their factory and tannery. 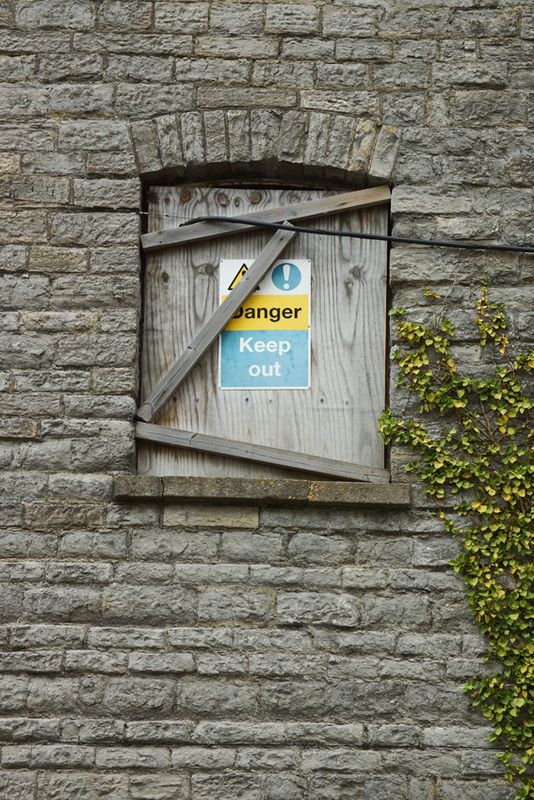 By the 1980s, sheepskin coats had fallen out of fashion and Morlands - along with Baily's, now owned by the same company - closed their Glastonbury operations. When they moved out of their site in town, it fell into decay. 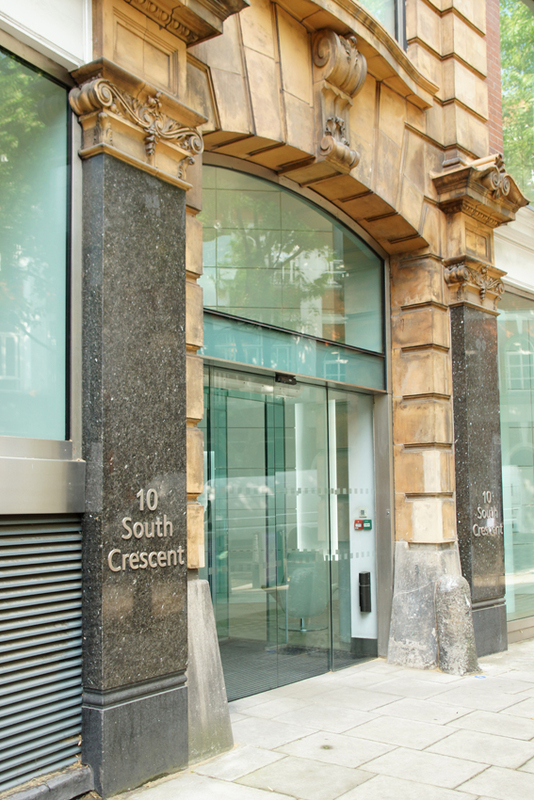 Part of it has been given new life as the Red Brick Building, home to various offices and organisations as well as the lovely Bocabar. 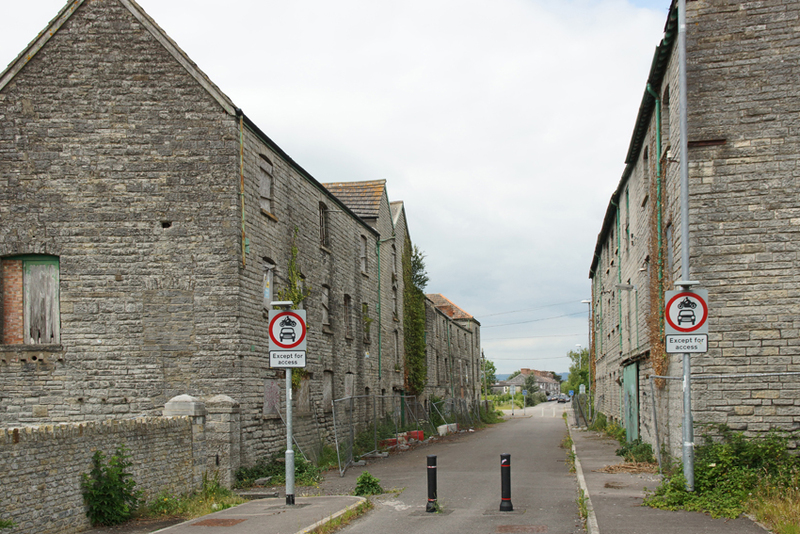 However, the neighbouring Baily's tannery and glove factory remains empty. 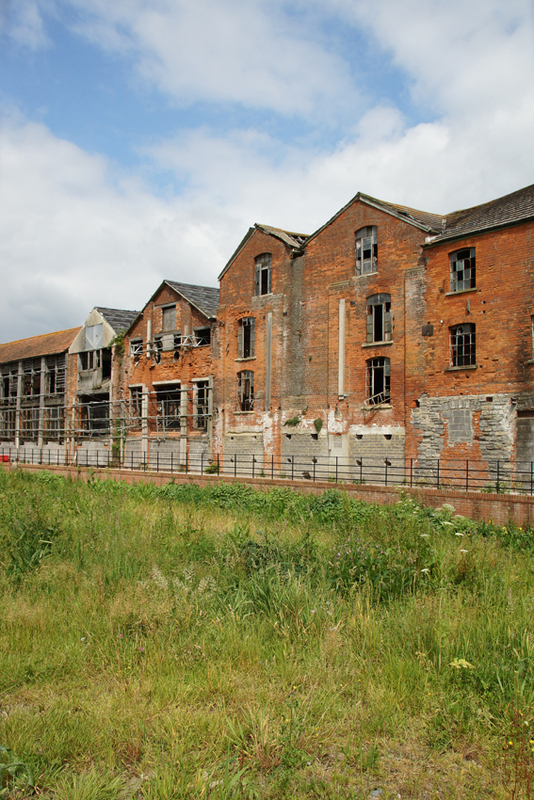 It's hard to imagine today that this was once a thriving industrial site, which made not only sheepskin products but also sporting goods - Muhammad Ali and Henry Cooper wore their gloves. Baily had started as a flour miller on the site, but diversified his business in the 1860s to include sheepskin rug manufacture. As his sheepskin business expanded, so did his premises: the current buildings, of local blue lias stone and brick, date back to the 1860s-1890s. They are listed, and happily, there are proposals to renovate them - but for the moment, the buildings are mothballed. 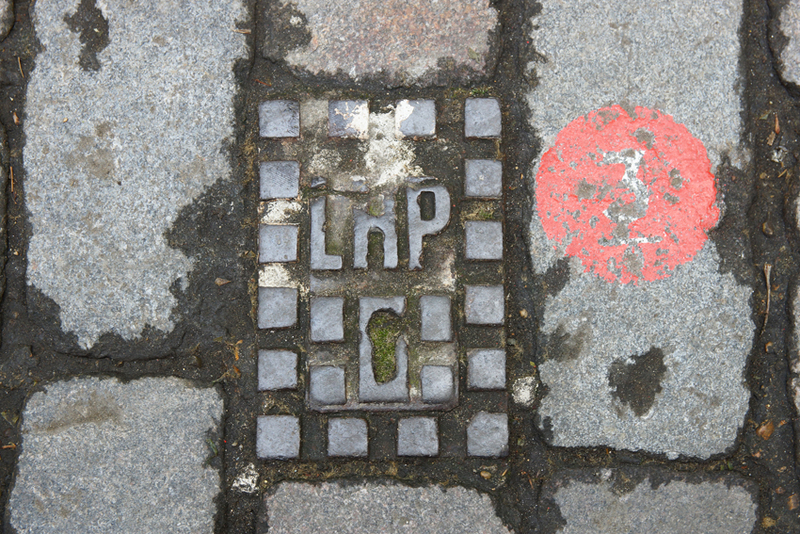 There are more photographs on Flickr. 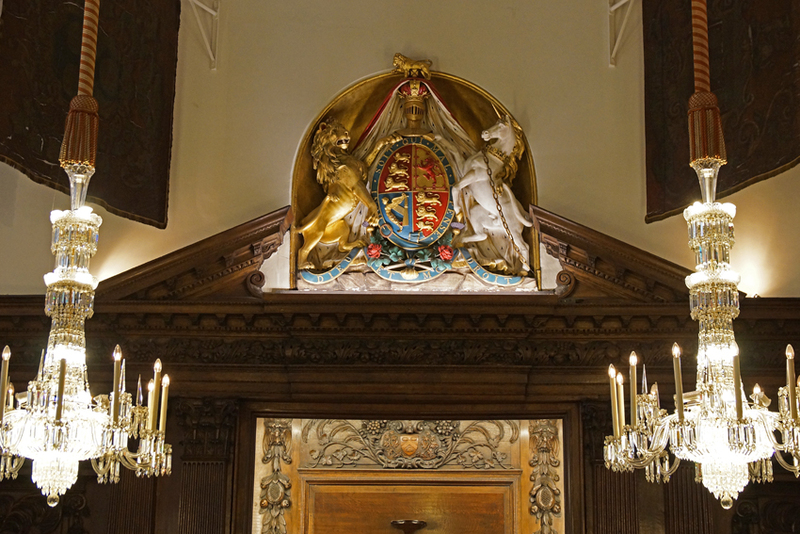 Close to Southwark Bridge, the Vintners' Hall location is no accident. 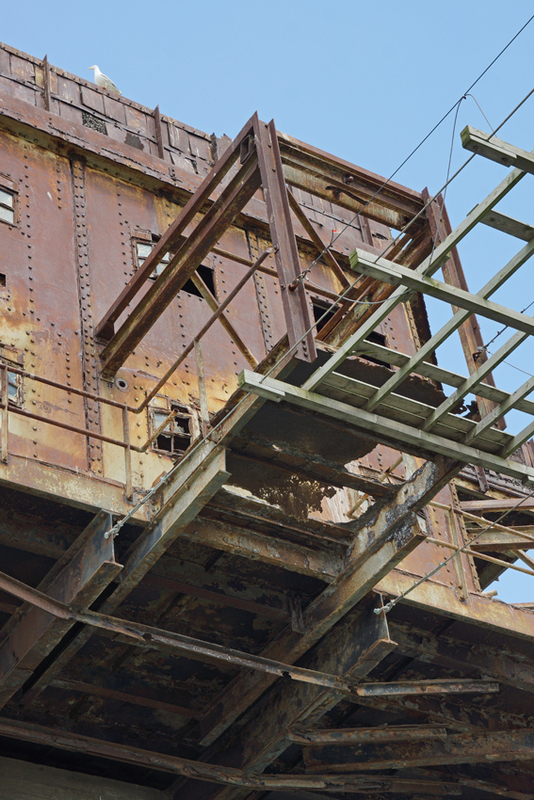 Proximity to the water was necessary for a trade whose product - wine - was imported by ship. Indeed, in the mid-fifteenth century, wine accounted for nearly a third of England's import trade. No surprise that the Vintners are one of the Twelve Great Livery Companies, having received their charter in 1363. The company retains strong links to the wine trade today. 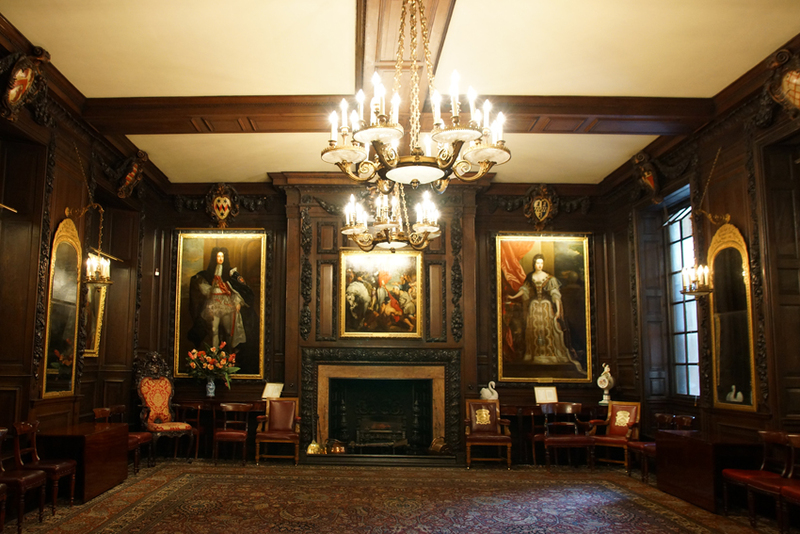 The Hall has been on this site since the fifteenth century, although it had to be rebuilt following the Great Fire of London. It was further altered when Upper Thames Street was widened in 1822, and the facade was changed again in 1910. 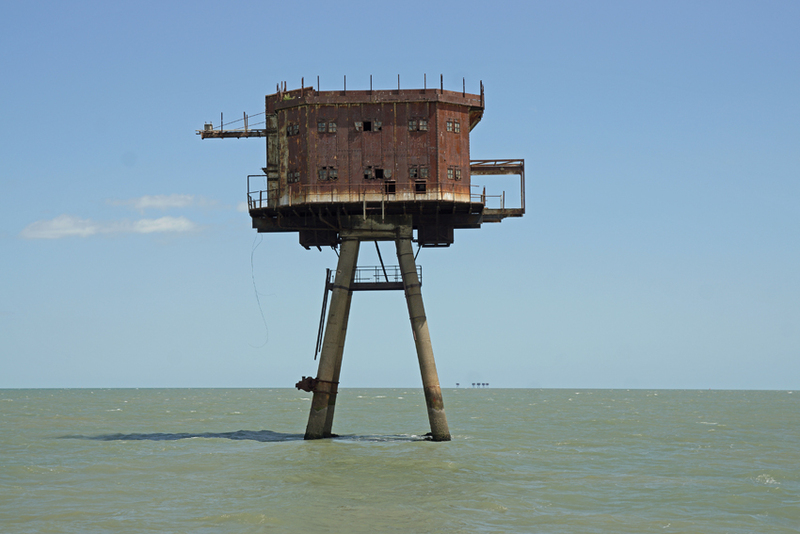 It is therefore full of historical interest: indeed, one of the first things a visitor sees inside is a schoolboy. He models the 1840 uniform of a pupil of the Vintry Ward school - another of these distinctive figures which can still be seen around London. 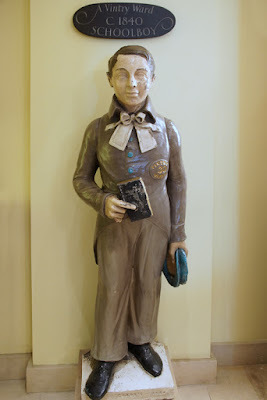 The schoolboy is one of several fine pieces of Coade stone here. The others are a pair of magnificent swans at the front doorway and the coat of arms in the Great Hall. 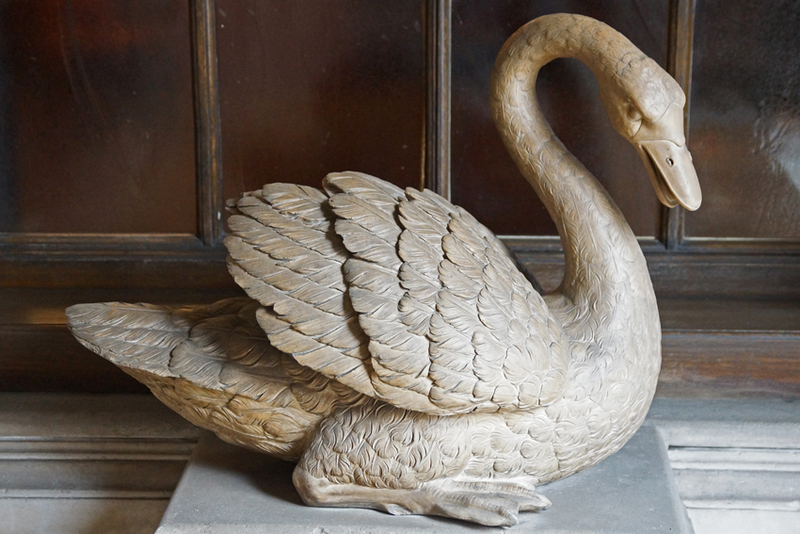 Swans are a recurring theme throughout the building. Given their riverside location and focus, it's perhaps unsurprising that the vintners have taken an interest in the aquatic birds. However, they have a very special role: along with the reigning monarch and the Dyers' Company, they are able to own wild swans. Every year, they catch and mark swans alongside the dyers in a 'swan upping' event. Unmarked swans belong to the Queen. Today, swan ownership primarily involves an obligation to look after their welfare. 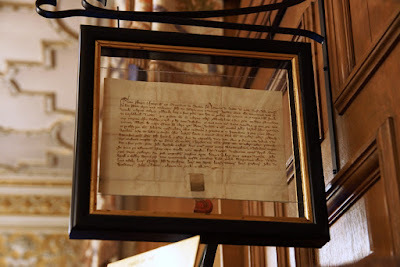 However, in the Tudor period it was a more valuable privilege since swans were a source of meat and writing quills. Personally, I prefer the wine! 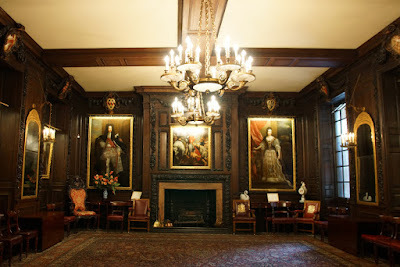 I visited with London Historians (previous visits include Drapers' Hall and Stationers' Hall). 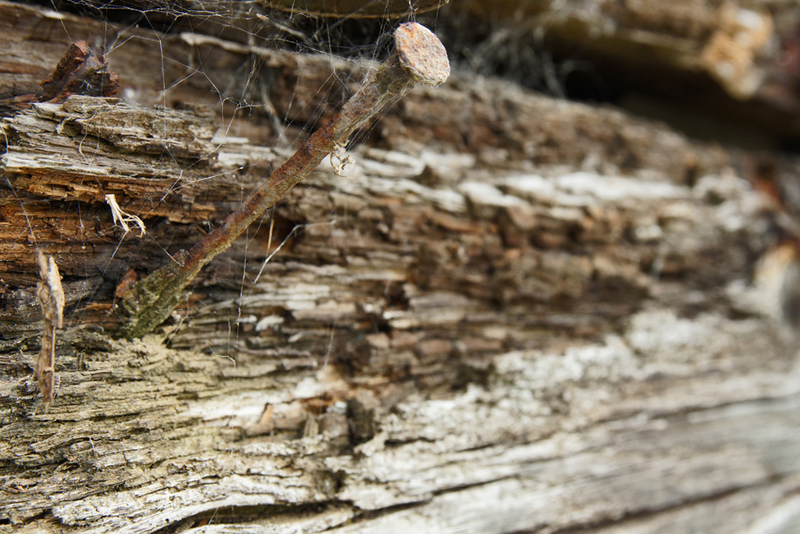 The cold weather of February 1895 became known simply as the Frost. The Illustrated Police News described it as 'terribly severe', asking 'what must be the intense suffering of those who are poor and out of work?' Temperatures of -24C were recorded in Buxton; the Thames froze over, with ice floes six or seven feet deep in places. 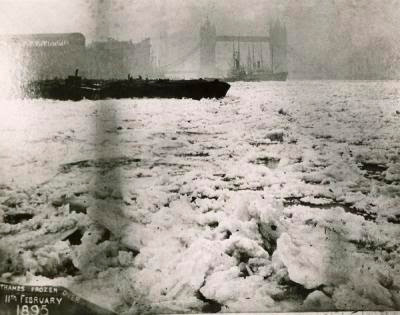 Barges and smaller boats were trapped in the ice, leaving watermen and port workers without employment. Many people died of hypothermia, while impassable railways and canals meant dwindling coal supplies. A man named Edward Blake was drowned in the Welsh Harp waters at Hendon last week. Some girls had ventured on the ice of the lake between the eastern side of the Edgware Road and the Midland Railway viaduct, and the ice broke, immersing two of them. In trying to rescue them Blake was drowned in sight of his brother, who did succeed in saving the females, but failed to rescue Blake. The deceased leaves a wife and several children. 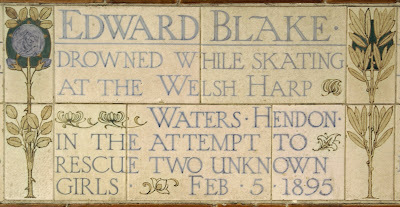 EDWARD BLAKE DROWNED WHILE SKATING AT THE WELSH HARP WATERS, HENDON, IN THE ATTEMPT TO RESCUE TWO UNKNOWN GIRLS, FEB 5 1895. Last Saturday was a lovely day for a boat trip. 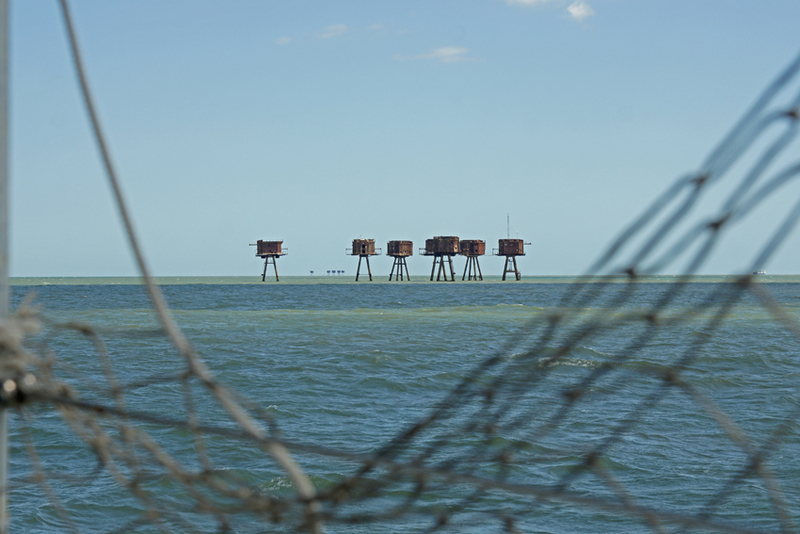 On board the X-Pilot, I enjoyed a picnic on the deck, views of the Thames Estuary, and the clear, fresh air. 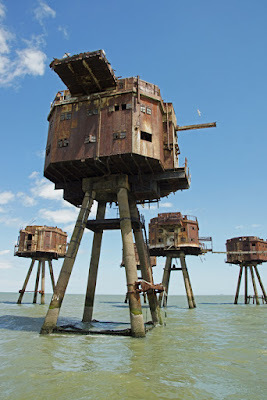 However, this was a boat trip with a purpose: we were visiting the Red Sands Forts. The X-Pilot is able to get closer to the forts themselves than other ships, and is now working in partnership with Operation Redsands Fort, which proposes to secure their future by conversion into a hotel, and Project Redsand. These Maunsell forts have an eerie presence, like abandoned invaders from a sci-fi movie. 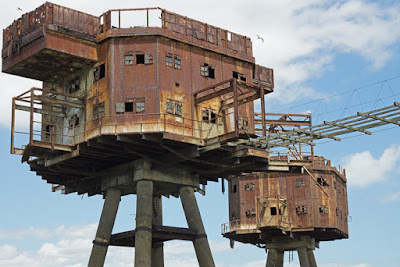 Their distinctive shapes, with long, concrete legs and rusting iron bodies, can be seen from shore -but are even more compelling when seen up close. 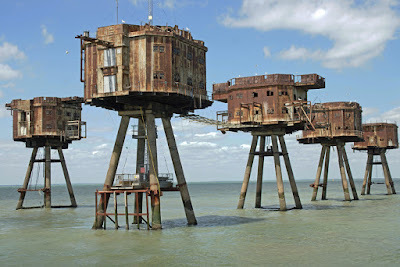 Protectors of London in World War II, home to pirate radio in the 1960s, today they are largely abandoned (although there are occasional residents). What will be their future? 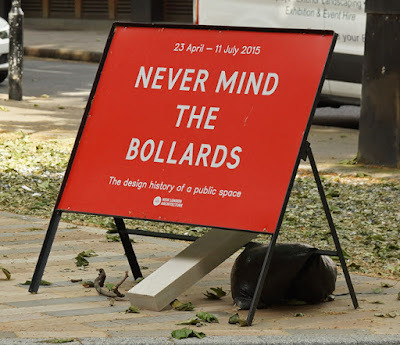 A punning title for an exhibition devoted to street furniture: it's no surprise that I was tempted along to the Building Centre on Store Street! 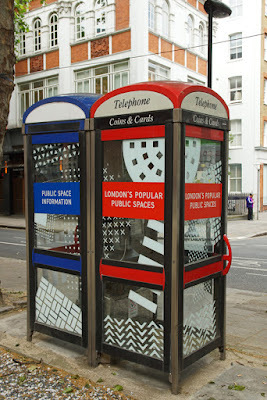 Or in fact, outside the Building Centre, since the exhibition makes clever use of the public space outside its doors. 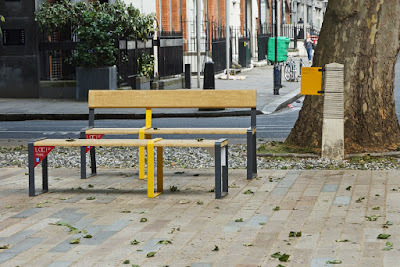 We often don't take much notice of the furniture and materials on our streets unless they get in our way. The uneven paving we stumble on, the lamp that doesn't work, or the unnecessary clutter ruining a photograph - those get our attention. 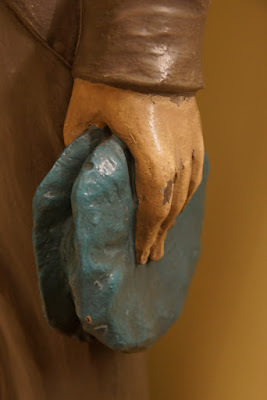 Yet the right things enhance our lives, whether we consciously notice or not: the quirky, historical feature, the bin that's just where we need it, the shelter of a tree on a sunny day. And careful design makes our city navigable: safe, attractive pavement surfaces, dropped kerbs, the information conveyed through texture and signage. 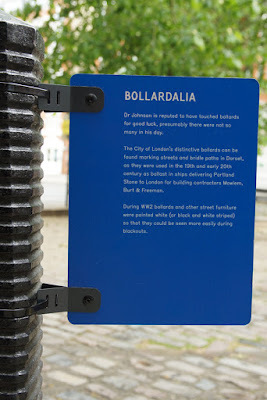 And suddenly, that sounds like a lot to convey and discuss in one small area - but Never Mind the Bollards does an excellent job. 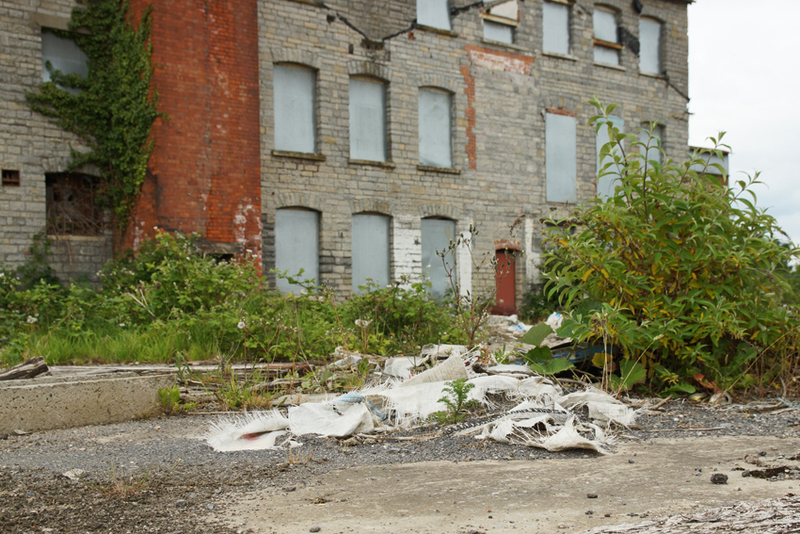 It uses the materials and furniture on the South Crescent of Store Street (and the sheer amount of features in this one area is a reminder of just how much we don't pay attention), enhanced by labels full of history, information and quotations. They are supplemented by some extra features: a mobile library, phone boxes full of information cards, and public seating. The result is an interesting space where you can sit and eat lunch, read a book or the exhibition's Bollard Observer, or find out more about the things that surround us. 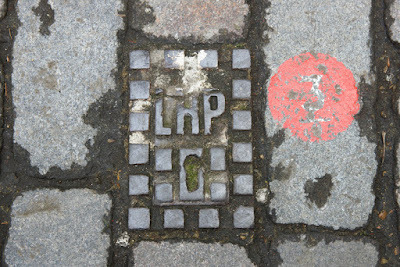 For example, the 'LHP' on this cover stands for London Hydraulic Power - the company that piped hydraulic power for devices such as lifts around London until well into the mid-twentieth century. The protective kerbstone on the right of this doorway indicates that it was once an open arch leading to a hotel yard. 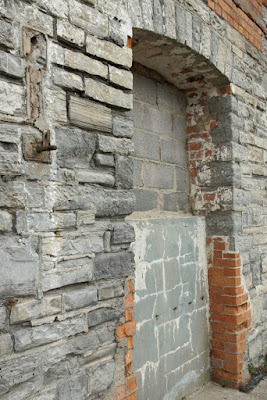 The stone saved the archway from damage by vehicle wheels. 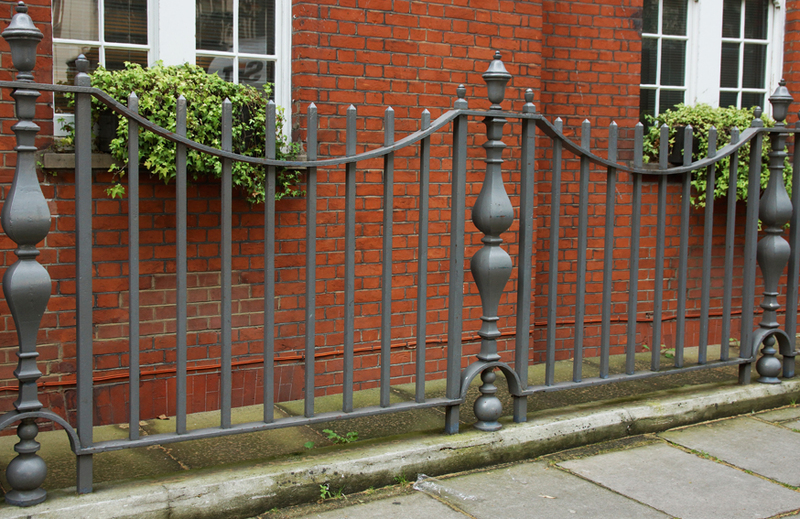 Infamously, many of London's railings were donated to the war effort in World War II - but their cast iron couldn't actually be recycled. They were therefore simply dumped in the Thames or at sea. 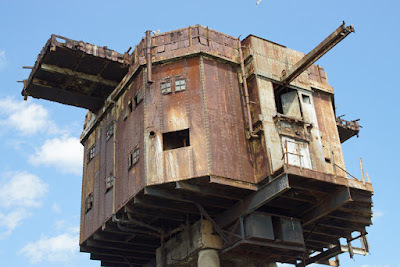 However, there are survivors such as these; the reason they were saved is because for most of their length, they protected passers-by from falling into the basement area. All the more important during the blackout! The curator Sarah Gaventa is very enthusiastic and extremely knowledgeable about all these things, so it was a pleasure to take a curator-led tour with her. She's giving another tour on 10 July, and there are lunchtime 'soapbox' talks throughout the exhibition as well. The exhibition is on South Crescent, Store Street, WC1E 7BT and runs until Saturday 11 July. 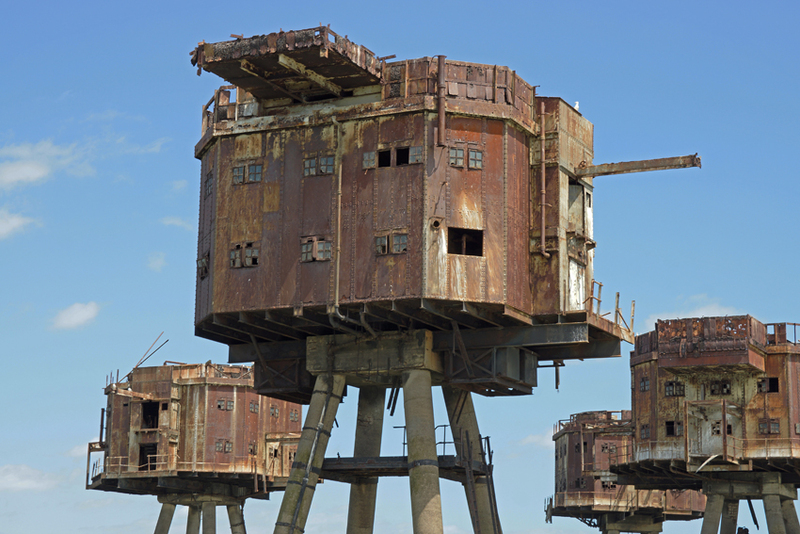 Go during the daytime and you can also visit the exhibitions and London model in the Building Centre - all free! 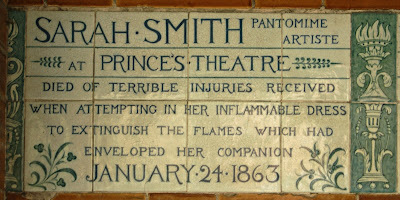 SARAH SMITH PANTOMIME ARTISTE AT PRINCE'S THEATRE DIED OF TERRIBLE INJURIES RECEIVED WHEN ATTEMPTING IN HER INFLAMMABLE DRESS TO EXTINGUISH THE FLAMES WHICH HAD ENVELOPED HER COMPANION, JANUARY 24 1863. The mistake? Sarah Smith actually died at the Princess's Theatre. However, there is also a more fundamental question as to whether the other details of her story are true. The Princess's Theatre on Oxford Street was known for its opera, drama and latterly melodrama. 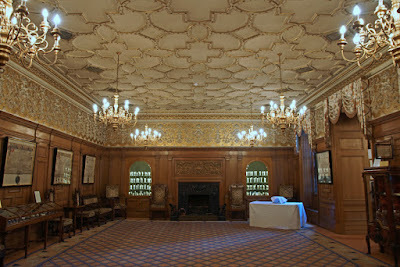 It was no 'penny gaff': in 1865, Cruchley's London gave seat prices ranging from 2l 12s 6d for a private box to one shilling for a seat in the gallery. Dion Boucicault, Charles Kean and the young Ellen Terry had all worked here and although Kean's revival of Shakespeare had ended a few years earlier, the theatre was still remembered for his productions. However, in the winter of 1863 it had a more seasonal show in place: a pantomime. Victorian pantomime offered a full evening's entertainment - as much as five hours - so the main performance was padded out with features such as ballets. Choruses commonly had as many as 30 members, including child and adult dancers. The incident of 24 January centred on one such ballet. For it, the stage was lit by 'tin pans', red and green lights; these apparently did not spark or sputter, but nonetheless set fire to the outfit of the dancer Mrs Hunt as she performed. The theatre's lighting expert suggested that the fire was caused by sparks from the match used to light the pans. According to a witness at the inquest, Hunt ran to the side of the stage where she passed Smith, setting her on fire too. Smith - also a ballet dancer - was wearing numerous skirts, and the ballet manager didn't know whether the outer skirt had been fire-proofed. Standard fire equipment such as damp blankets should have been provided but was not available, although a fire hose was. Robert Roxby, stage manager, used his Inverness cape to put out the flames on first Hunt and then Smith. 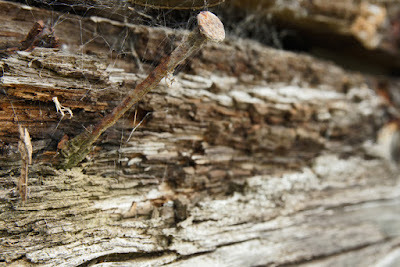 Mrs Hunt survived her injuries, albeit scarred for life and unlikely to return to her previous career. 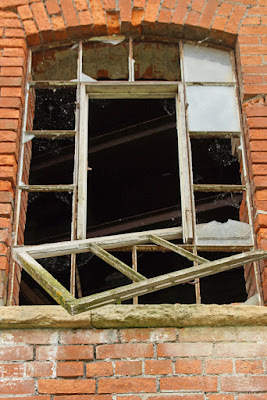 However, Sarah Smith was not even that fortunate. She suffered burns to one-third of her body including her face, neck, back, front, chest and arms, and died in the Middlesex Hospital of 'exhaustion caused by burns'. Her funeral, paid for by the theatre lessee Mr Lindus, saw 'some demonstration of sympathy on the part of the theatrical fraternity as well as of the general public.' She was buried in Nunhead Cemetery. Throughout the inquiry, there was no suggestion that Smith caught fire while trying to save her colleague. Why, then, was Watts sure that this is what had happened? The mystery remains - although as he generally relied on newspaper accounts to select 'ordinary heroes', presumably there was a report somewhere which told the more romantic version recorded in Postman's Park. Whatever the truth of the matter, Smith's story is certainly a tragic one and a vivid illustration of the omnipresent threat of fire in the Victorian theatre. The death appears to have had little effect on the Princess's Theatre, which remained in business for many more decades. Rebuilt in 1880, it was finally demolished in 1931 to make way for a Woolworth's store; more recently, it was home to HMV. A new addition for the scary food collection! This one's from Cardiff, and he's a doughnut. 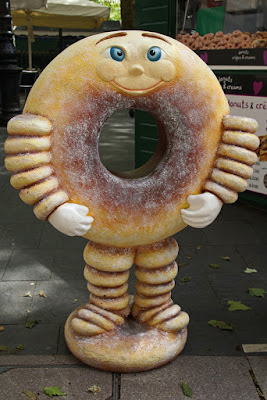 With doughnut arms and doughnut legs and doughnut feet. Stood on ... another doughnut. And wearing an expression of cheerful, cross-eyed evil. But at least no purple tongue (Scarborough doughnut, I'm looking at you).